Last month, Lego unveiled new trailers for the upcoming video game Lego Dimensions, where we saw iconic characters such as Batman and Doctor Who in Lego form. Today, Lego Dimensions has released yet another gameplay trailer, which features beloved characters Shaggy (voiced by Matthew Lillard) and Scooby-Doo (voiced by Frank Welker) as they get tricked into entering the Lego world. There we see them interact with Gandalf (voiced by Tom Kane) from The Lord of the Rings along with The Lego Movie's Batman (voiced by Will Arnett) and Wyldstyle (Elizabeth Banks). The groovy world of Scooby-Doo is coming to life and mashing up with 13 more franchises like never before in LEGO Dimensions, the upcoming entertainment experience that merges physical LEGO brick building with interactive console gameplay. Begin the adventure with the LEGO Dimensions Starter Pack, which features a complete, mission-based Scooby-Doo level that Batman, Wyldstyle, and Gandalf must traverse in their quest to stop Lord Vortech and save the LEGO Multiverse. For the first time in a LEGO video game, players can experience Scooby-Doo gameplay that combines distinctive, blocky LEGO art style with the cel-shaded look of the original, animated cartoons. Also available at the launch of the Starter Pack: The Scooby-Doo Team Pack, which adds more to the experience with LEGO Scooby-Doo and LEGO Shaggy minifigures, plus a LEGO Mystery Machine, LEGO Scooby Snack, and access to open world gameplay in the Adventure World of Scooby-Doo. Launching September 27, 2015, LEGO Dimensions will be available for Xbox One, the all-in one games and entertainment system from Microsoft and the Xbox 360 games and entertainment system from Microsoft, PlayStation 4 and PlayStation 3 computer entertainment systems and the Wii U system from Nintendo. LEGO Dimensions, the upcoming entertainment experience that merges physical brick building with interactive console gameplay, will include gameplay from The Simpsons, Doctor Who, Ghostbusters, Portal, Jurassic World, Midway Arcade, LEGO Chima and "Scooby-Doo!" These fan-favorite worlds, most of which have never before been in a LEGO video game, will converge with DC Comics, The Lord of the Rings, The Lego Movie, The Wizard of Oz, LEGO Ninjago and Back to The Future worlds in one thrilling adventure playable with the LEGO Dimensions Starter Pack. 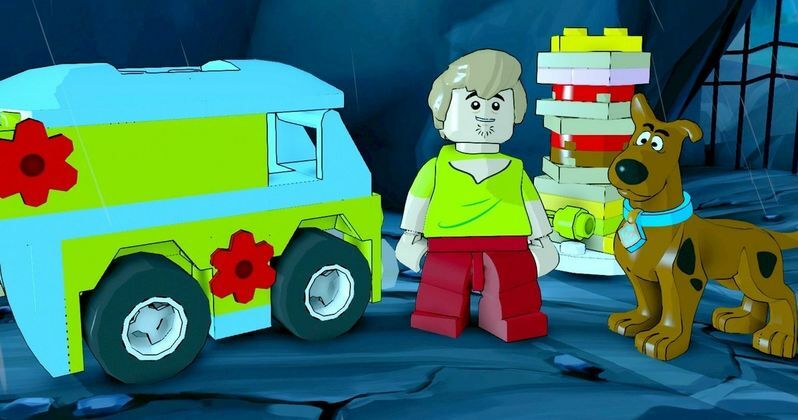 Check out the new trailer and watch how Shaggy and Scooby-Doo fit into this sprawling LEGO world.